You might have seen them around: silly and whimsical greeting cards featuring cats, yes, but also giraffes, badgers, bison, otters and snails, to name a few. They are the work of local artist Sara Gettys, who draws inspiration from her cat, Furdinand. The human-cat team is known as Cat Pants Studio, creators of stationery, but also project bags, posters, notepads and soon, mugs. Sara’s sense of humor and love of cats shine through in these creations. “I chose the name Cat Pants because it is a variation on one of Furdinand’s nicknames,” she explains with a grin. Sara currently works on Cat Pants Studio material from the top floor of her craftsman house on Olympia’s West side. We agree to meet there, where the magic happens. With its low, louvered ceiling, wood paneling and creaky wooden floors, stepping into the tiny studio is not unlike walking into an elves’ workshop. Sara shows me around. 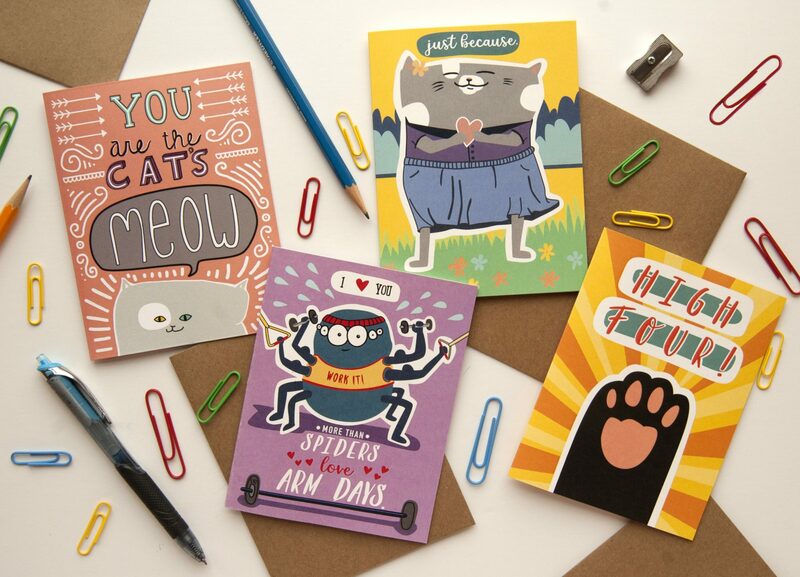 “I started making cards with all cats, but my ‘simile’ cards use animals you typically don’t see on stationery,” she says, showing me one wall entirely dedicated to existing prints – dapper, hat-wearing cats wishing a happy birthday, otters sipping eggnog, giraffes sporting aviator glasses and snails wearing earmuffs – among many others. A sparse wooden desk faces a television. “I like to watch sci-fi while I work,” she shares. I ask Sara how long she’s been making art. “Basically always,” Sara answers simply. 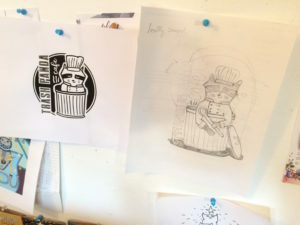 At the age when most of us were leaving off crayons in favor of other pursuits, Sara’s love for creative work endured. She is originally from Norman, Oklahoma, a little college town located right where the prairie ends and the woodlands begin. She studied English and Creative Writing and minored in Art at Hollins University in Roanoke, Virginia and earned a Masters in Journalism from the University of Missouri. She then moved to Yakima to work as a photographer for the Yakima Herald-Republic and stayed there until the newspaper decided to downsize staff to cut costs. About five years ago, she moved to Olympia to work as a digital media producer for South Puget Sound Community College. Now that she’s put down roots here, Sara hopes to become more active in the Olympia arts community. 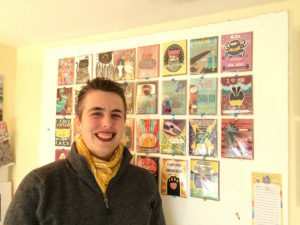 While she loves connecting with people through her art—not just anyone is drawn to lederhosen-wearing lemurs—finding the time to grow Cat Pants Studios while juggling a full-time job and several other projects can sometimes be a challenge. Sara manages by working on Cat Pants Studio on her lunch breaks, in the evenings and on the weekends. “Working on the business a little bit every day might be slow going, but at least it’s something,” she says. 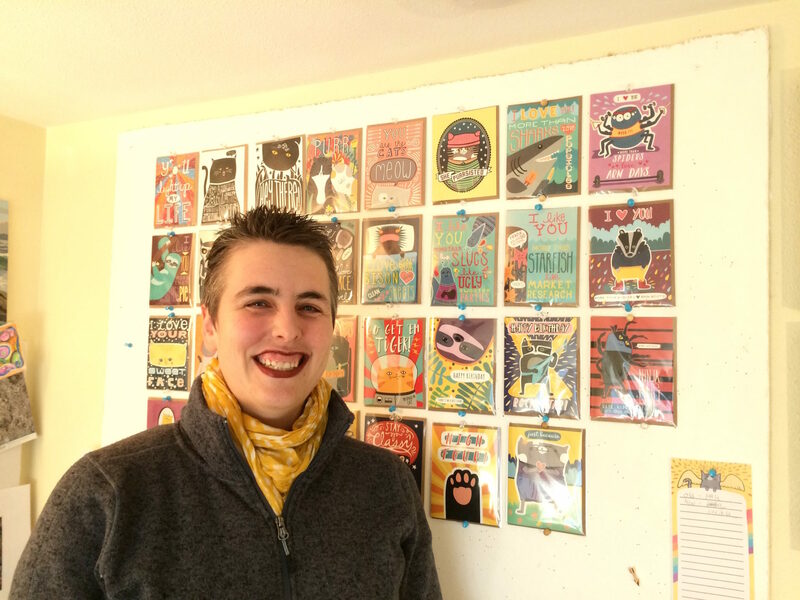 She produces about two cards a month and has set herself a goal of growing her catalog to eighty designs to get her to the next step –finding a distributor who can get her cards out to stores for her. 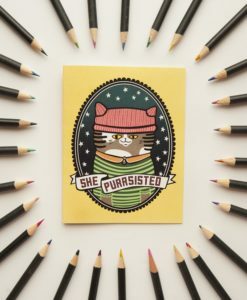 Cat Pants Studios has an online shop that features the entirety of her catalog, and you can also find Cat Pants Studio stationery at Compass Rose in downtown Olympia and at various crafts fairs in the region, especially Crafty Wonderland, a twice-yearly crafts expo in Portland. If you’d like to check out her other work, Sara’s has several woodcut paintings for sale at Childhood’s End Gallery gift shop and some cheese trays at the Mouse Trap, both located in downtown Olympia. You can also find her work at the June Art Fest in Yakima.